joanofdark.com: The New Terminator Movie and new yarn! The New Terminator Movie and new yarn! So Dill and I got free passes yesterday for the new Terminator movie! Great right? Um yea.. except I had practice! With our Ft. Wayne bout this close there was no way I could skip a single practice or workout. So Dill took Rusty to the movies, and I got to go sweat and bleed for 2 hours at the secret lair. It was a good practice. We had a really, really hard workout, and lots of core, so I'm glad I went. And Dill, being a sweetie, totally brought home a little bit of movie popcorn for me ;) He said the movie was great, but is refusing to tell me more until I go see it. He said it was not as good as the new Star Trek, but I don't expect it to be. Over the weekend, Dill was in Evansville calling a double header for the Demolition City Girls. I spent Saturday working out like crazy, upping my cardio and working on squats. This was a bit of a mistake, considering Sunday's practice was nothing but scrimmage, sprinting, and leg training. I was so sore! As always after a practice though, I was pretty hyper. 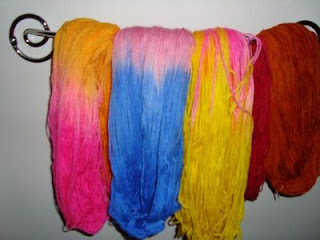 So I dyed some new bare yarn that I got in! It's for the Handicraft Exchange coming up. The girls I share an etsy store with always get a booth. The pink and orange was really fun to do. I could not get the right orange with acid dye, so I ended up dumping in a bunch of kool-aid and food coloring to get the orange brighter. I would still love to get an orange as neon as the yellows I've been able to get! More experimenting I guess! Oohhh, that means I get to order more bare yarn!